Hearty, healthy soups are the best kind of comfort food for the Winter months! They leave you feeling full, but energized instead of heavy. One of my favorite kinds is the bean or pea based soups. 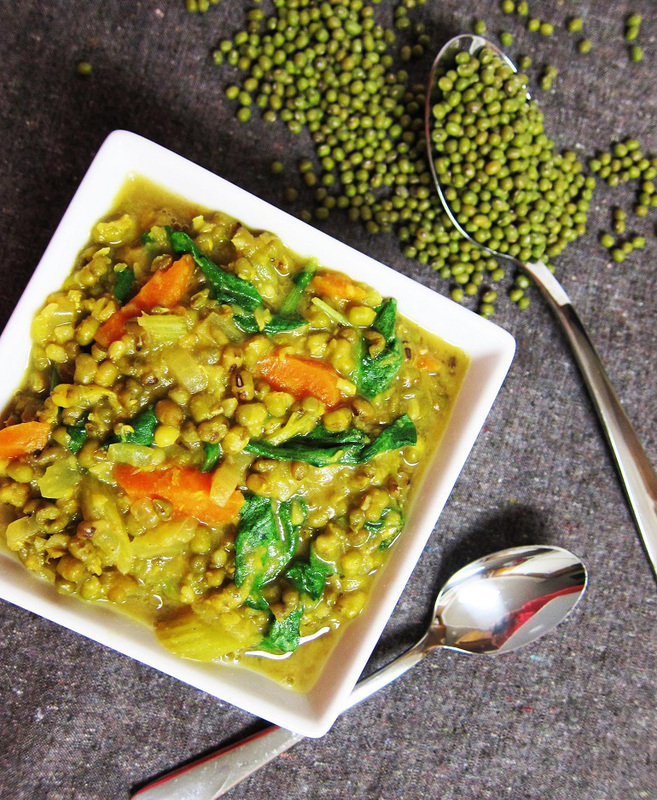 The recipe I am sharing today is made with mung beans, and the texture is almost like a lentil or split pea soup. It is delicious, because it is packed with flavor thanks to the curry spices, and the coconut milk I add gives it richness without adding any dairy. I stir in greens at the last minute to boost the nutritional value as well. This soup has plenty of fiber and protein and is an awesome comfort food dinner to enjoy on a chilly night, not to mention it is quick and easy to make! Combine all ingredients and 3 cups filtered water in a medium pot, and bring to a boil. Lower to a simmer, and cook until the veggies and mung beans are tender, about 30 minutes adding that additional cup of water along the way if needed if the beans absorb too much. Remove from heat, and stir in coconut milk and kale until just wilted. Enjoy!